Oral health refers to the health of our teeth and our mouth. Maintaining good oral health includes keeping our teeth free from cavities and keeping our gums free from disease. It is important to take care of our mouth and teeth starting in childhood. If we don't, we could have problems with our teeth and gums - like cavities or even tooth loss. 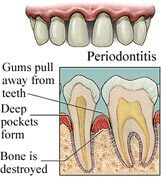 Periodontitis is an infectious, destructive inflammatory disease of the soft and hard tissues or gums (gingivitisgingivitis) surrounding the teeth and is the leading cause of tooth loss. Why it is so important to take care of teeth? Because we have only two sets of teeth to last for a lifetime! Poor oral health can affect more than just our mouth; it can affect other areas of our body as well. Teeth and gums reveal the inside story of our overall health - from the signs of diabetes to heart disease to osteoporosis. To understand what happens when our teeth decay, it is helpful to know what's in our mouth naturally. Saliva - Our mouth and teeth are constantly bathed in saliva. We never give much thought to our spit, but this fluid is remarkable for what it does to help protect our oral health. Saliva keeps teeth and other parts of your mouth moist and washes away bits of food. Saliva contains minerals that strengthen teeth. It includes buffering agents. They reduce the levels of acid that can decay teeth. Saliva also protects against some viruses and bacteria. Bacteria can live in our mouth in the form of plaque, causing cavities and gingivitis, which can lead to periodontal (gum) disease. In order to keep our mouth clean, we must practice good oral hygiene every day. Plaque - Plaque is a soft, gooey substance that sticks to the teeth a bit like jam sticks to a spoon. Plaque also accumulates on the surface where toothbrushes can't reach. Plaque contains colonies of bacteria and other organisms, clumping together with bits of food. Also in the mix are bacteria byproducts, white blood cells and body tissue. Plaque grows when bacteria attach to the tooth and begin to multiply. Plaque starts forming right after a tooth is cleaned. It builds up to measurable levels in about an hour. As time goes on, the plaque thickens. Within two to six hours, the plaque teems with bacteria that can cause cavities. Plaque also produces substances that irritate the gums, making them red, sensitive and susceptible to bleeding. This can lead to gum disease, in which gums pull away from the teeth and form pockets that fill with bacteria and pus. 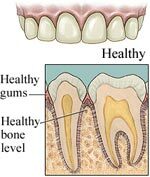 If the gums are not treated, the bone around the teeth can be destroyed and teeth may become loose or have to be removed. Calculus - If left alone long enough, plaque absorbs minerals from saliva. These minerals form crystals and harden the plaque into calculus. Then new plaque forms on top of existing calculus. This new layer can also become hard. Bacteria - We have many types of bacteria in our mouths. Some bacteria are good; they help control destructive bacteria. When it comes to decay, Streptococcus mutans and Lactobacilli are the bacteria that cause the most damage to teeth. We can never get rid of all the bacteria in our mouth. But we can take steps to control bacteria. The bacteria in our mouth need food to live and multiply. When we eat sugary foods and other carbohydrates, the bacteria use them as food, too. The bacteria then produce acids that can dissolve tooth enamel (outer layer of the tooth). It is not just candy and ice cream we are talking about. All carbohydrate foods eventually break down into simple sugars. These include glucose and fructose. Some of this process begins in the mouth. Bacteria in our mouth turn the sugars in these foods into acids. These acids begin to dissolve the mineral crystals in teeth. The more times we eat each day, the more times our teeth are exposed to an acid attack. This attack can lead to tooth decay, also known as dental caries. First, the acid begins to dissolve calcium and phosphate crystals inside a tooth. A white spot may appear on the enamel in this weakened area. But the loss of minerals develops beneath the surface of the enamel. The surface may still be smooth. How can we get rid of Plaque? The best way to remove plaque is by brushing and cleaning between the teeth twice every day. Brushing removes plaque from the tooth surfaces. Brush your teeth twice per day with a soft-bristled brush. The size and shape of your toothbrush should fit your mouth and allow you to reach all areas easily. Use an antimicrobial toothpaste containing fluoride, which helps protect your teeth from decay. Clean between the teeth once a day with floss or interdental cleaners to remove plaque from between the teeth, where the toothbrush can not reach. Flossing daily is essential to prevent gum disease. You should brush your teeth well for no less than three minutes and your brush should be replaced once every three months. Good oral health involves more than just brushing and cleaning between the teeth. To keep your teeth and mouth healthy for a lifetime of use, there are steps that you should follow. Understand your own oral health needs: Talk with your dentist, other oral health care specialist or hygienist about any special conditions in your mouth and any ways in which your medical/health conditions affect your teeth or oral health. For example, cancer treatments, pregnancy, heart diseases, diabetes, dental appliances (dentures, braces) can all impact your oral health and may necessitate a change in the care of your mouth and teeth. Be sure to tell your dentist if you have experienced a change in your general health or in any medications you are taking since your last dental visit. Dentinal sensitivity occurs when the dentin (middle layer) of a tooth is exposed. Normally, the dentin is covered by enamel above the gumline and by cementum below the gumline. Dentin is made up of tiny openings called tubules. Inside each tubule lies a nerve branch that comes from the tooth's pulp (the nerve center of the tooth). When the dentin is exposed, cold or hot temperature or pressure can affect these nerve branches. This causes sensitivity. Receding gums that expose the tooth's roots. Receding gums often are caused by periodontal diseases or by brushing too hard. If you feel a sharp pain upon biting, you may have a broken or cracked filling. Pain when you release a bite is a sign of a cracked tooth. If a tooth needs root canal treatment, there is no good way to prevent pulpal sensitivity other than to get the needed treatment. Delaying root canal treatment is not recommended. It may result in further problems. You've probably heard that fluoride is a good thing for teeth. This is true. Fluoride, in moderation, is a very good thing for teeth for people of all ages. An exposure to fluoride (like that contained in toothpaste and city tap water) is probably the most effective cavity prevention treatment available today. Dental researchers have shown that just introducing fluoride into a (previously unfluoridated) city's drinking water supply can reduce its inhabitants' rate of tooth decay between 40 and 70 percent. Demineralization begins with the bacteria in the plaque on our teeth. They feed on sugar and other carbohydrates in our mouth and produce acids. The acids dissolve crystals in tooth enamel. The loss of enamel is balanced by remineralization. In this process, minerals in the saliva, such as fluoride, calcium and phosphate are deposited back into the enamel. Too much loss of minerals without enough replacement leads to tooth decay.